You will need an Android emulator for testing, and the Android SDK. You should have a basic knowledge of React Native. In this tutorial, we’ll be implementing the classic game Tic-Tac-Toe with React Native and Pusher. This tutorial assumes that you already have a basic knowledge of React Native. Pusher Account - a Pusher account is needed to create a Pusher instance that we will be using in this tutorial. If you don’t already have an account, you can sign up here. After creating an account, you can go ahead and create a new Pusher app. Android SDK - we’ll be specifically deploying the app as an Android App so you need the Android SDK to run the app on an Android device or emulator. A Machine that’s ready for React Native Development - if you don’t already have your machine set up for React Native, you can follow the Getting Started Guide on the official docs. Be sure to follow the instructions in the "Building Projects with Native Code” tab. Genymotion or Android Emulator - this is optional, as you can always use a real device for testing. 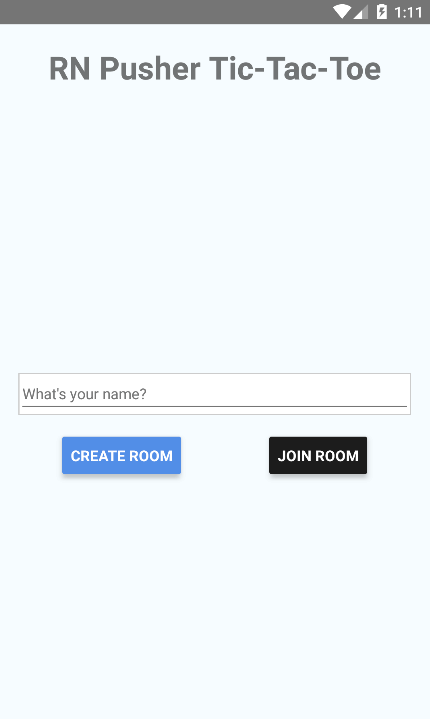 When a user has chosen to create a room, the room ID will be generated by the app. 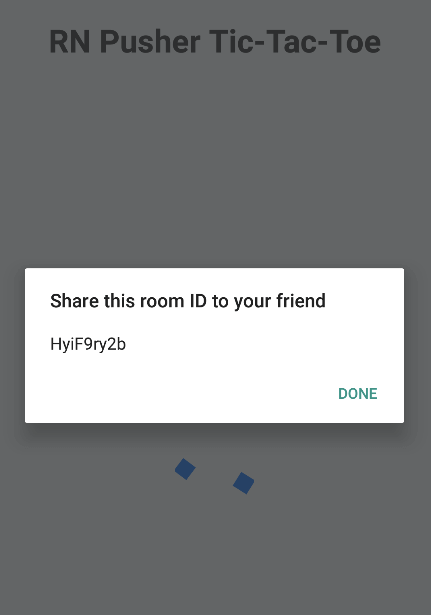 This room ID should be entered by another user so the game can begin. Throughout this tutorial, I’ll be referring to the user other than the current user as the “rival”. Once someone has joined the room, the Tic-Tac-Toe board will be shown. At this point, any of the players can start the first move. 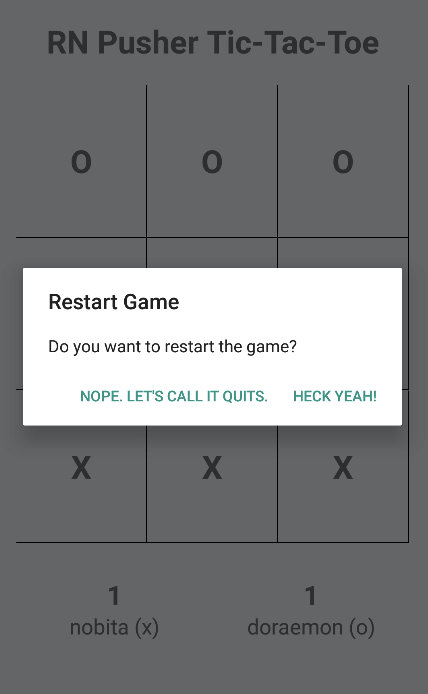 Once the last move is used to fill the board, an alert will be shown to the room creator asking whether they want to restart the game (empty the board and start over) or end the game. If the room creator has chosen to end the game, the app state will reset and the default screen will be shown. You can find the full source code of the app in its Github repo. The server component authenticates the requests that will come from the app. This is needed because we’ll be using client events to send data from client to client. 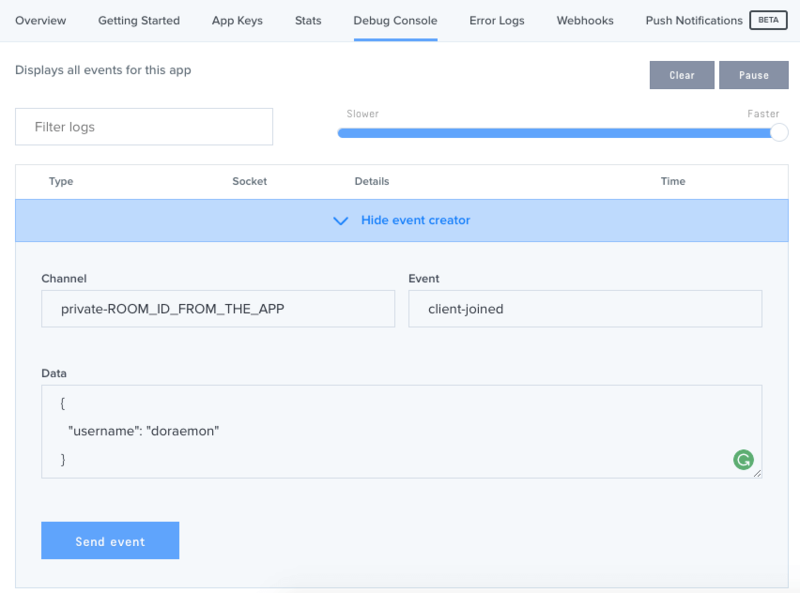 The server component authenticates the request whenever an app tries to connect using the API key of the app you created earlier. This way you can verify if the request really came from your app. Line 1 imports express, a web framework for Node.js which allows us to create a server and respond to specific routes. Line 2 imports body-parser, a middleware for parsing the request body so that the data passed in the request body can be accessed like an object. For example, in the /pusher/auth route, this allows us to do the following to access the socket ID from the request body: req.body.socket_id. Line 3 imports the pusher package. This allows us to communicate with the Pusher app you created earlier in order to authenticate the user (line 25). Line 5 imports the dotenv package which loads up the config in the .env file you created earlier. You can see them being accessed as environment variables on lines 12 to 15. Lines 7 to 9 tells Express to use body-parser to create two different middleware entries, one for parsing JSON strings and the other for parsing URL encoded strings. The extended option is set to false because we’re not really expecting rich objects and arrays to be included in the request body. Instead, we’re only expecting plain JSON strings to be passed in the request body. Lines 18 to 20 are for testing if the server is running, you can access http://localhost:5000 from your browser. If you see the string output “everything is good…” then it works. Lines 22 to 27 are for processing the authentication requests coming from the app. The authentication request is sent every time a client connects to Pusher from the app that we’ll be creating. Note that the code for authenticating users doesn’t really have any security measures in place. This means anyone can just use your Pusher app if they happen to get a hold of your Pusher app credentials. pusher-js - for using Pusher. This allows us to send messages to channels, and receive messages from channels in real-time. react-native-prompt - for showing a prompt box, used for getting user input. react-native-spinkit - for showing a spinner while waiting for another player to join the room. lodash.range - for generating arrays which has a specific number of items. shortid - for generating unique IDs when creating a room. Make sure that RNPusherTicTacToe matches the name you’ve given to the app when you created it with react-native init. When the component is updated, we need to check whether the user is already waiting for a rival and that a Pusher channel has not been bound to any events yet. If that’s the case, we listen for the client-joined event. When this happens, update the state so that the UI shows the game board. If the user is the room creator, trigger the same event so that the rival (the one who joined the room) is informed that the game can already start. In the render method, the Home component is shown by default. It displays the UI for letting the user enter their name, and either join or create a new room. Once a rival joins a room, the game board will be shown. The Spinner component is used as the transition state between the two while waiting for a rival to join a room. Once the rival joins the room, the following function is executed. The room_id is provided by the prompt box so we simply use it to subscribe to the same channel as the room creator. This allows the two users to communicate directly using this channel. Note that the code below doesn’t handle if a third person happens to join the room. You can add the functionality to check for the number of users in the room if you want. That way the app will reject it if there are already two users in the room. All this component does is to display the title of the app in the header. Next, create a components/Home.js file. As mentioned earlier, this is the default component that is shown the first time the user opens the app or when the room creator ends the game. Next, create a components/Board.js file. This component serves as the main meat of the app because it’s where the game happens. In the constructor, bind the methods for generating the content for the board (3x3 board). The possible combinations for getting a score are also declared. The ids are used as the IDs for referring to the individual blocks. As you can see, it’s an array which has three arrays in it. 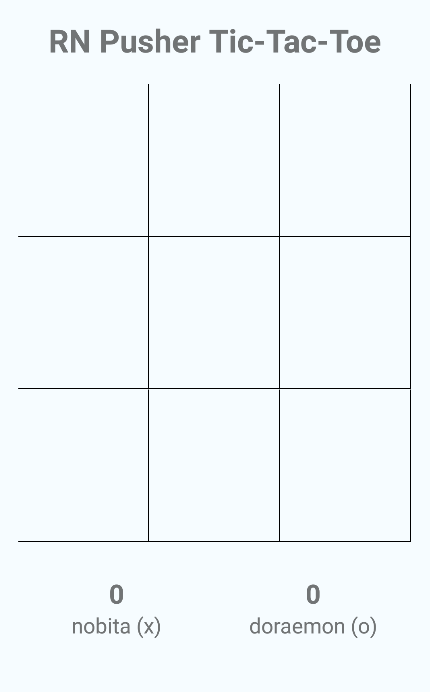 Each of these arrays pertains to the rows in the board, and its items pertains to the individual blocks. So when referring to the second column in the first row of the board, you can get the ID for that by using this.ids. This will then return 1. The ID will be used later on to determine the scores based on the possible_combinations array. Right below the declaration for this.ids is the array which will be used to generate the rows in the board. Once the component is mounted, we then want to listen for the client-make-move event to happen. This event is triggered every time a user places their piece (either “X” or “O”) on the board. Note that this will only be triggered on the rival and not the user who has sent the event. Every time a move is made, the updateScores function is executed. This loops through all the possible combinations. It uses the every() method to check whether a specific piece was used on each of the items for a possible combination. For example, if “X” is used for blocks 0, 1, and 2, then 1 point is rewarded to the user who has “X” as their piece. Here’s the render() method. It uses the generateRows() method to generate the content for the board. Below that is the score display for the two users. The generateBlocks() method is used for generating the individual blocks on each row. It uses the TouchableHighlight component to create a view which can be tapped on by the user. Each block displays the piece of the user who first tapped on it. Tapping on a block executes the onMakeMove() method which places the user’s piece on that block. The onMakeMove() method receives the row_index and the block index. These allow us to get the block id which is used to set the piece on a specific block. After that, the updateScores() is also called to update the user scores. To update the UI of the rival, the details of the move is sent using the client-make-move event. Once the board has been filled up with pieces, ask the room creator if they want to restart or end the game. If the room creator decides to restart the game the board is simply reset to its default state, otherwise the app is reset to its default state (the same as when the app is first opened). Be sure that you already have a connected device or an emulator opened when you execute this. If you’re using either Genymotion or the Android emulator, and you don’t really want to test on a real device, then you can use the browser to simulate the rival. Once that’s done, run the app and create a new room. Then copy the room ID shown in the alert box. This will place the “O” piece on the first box in the game board. From there you can place a different value for the index and row_index to emulate the game play. The method I showed you above is great if you only want to test inside your own local network. But what if you want to test it out with your friends outside the network? For that, you could use Now. I’m not going to go into details on how to deploy the server, but you can check out their docs. Now is free to use, the only downside is that your code will be available publicly.